Armed with this knowledge, I mixed them all up together, fiddled with the proportions a little - and it was good. 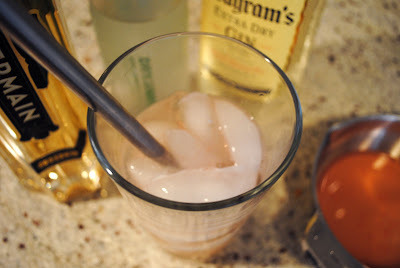 Combine the ingredients in a mixing glass (a pint glass works well) full of ice. Stir for 30 seconds and strain into a cocktail glass. Verdict: This drinks wins for both ease of creation and sheer deliciouness. It's a beautiful balance of all the flavors. And it doesn't hurt that it so damn pretty. Edited to add: It looks like the jerks at the Dry Soda Company have discontinued the lemongrass flavor, so if you must have lemongrass soda, you'll have to make your own. Or, what is much easier: substitute lemon perrier for the soda. I promise it's just as delicious. That is a really pretty drink. 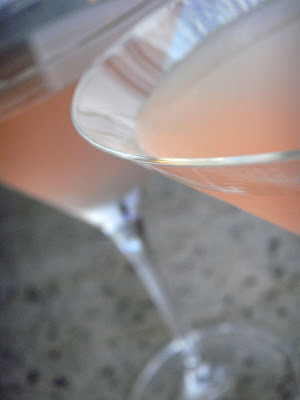 I might adore it.I'm going to have to see if any of the liquor stores on base carry St. Germain's. They have a pretty good selection with decent prices, so I might luck out. On another note, what in the world can I mix Bacardi Select Gold Rum with? My dear husband bought a huge bottle and the stuff is pretty nasty (to us) but then we're just drinking it as rum and cokes. It ends up tasting like cough syrup. Any advice? Ooh, a challenge! I love it. And this is perfect because I haven't done a lot of rum drinks lately. I will do some research and get back to you. Oh, and you might have a tricky time finding the Dry lemongrass soda in Europe, but perrier may work as a substitute. I can attest to the wonderful loveliness of Nancy's French BullDog. 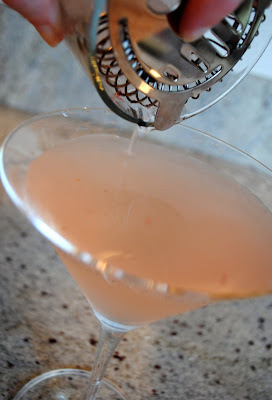 I don't care for Salty Dogs, mostly because of the grapefruit. This was a delightful and tasty adult beverage especially if you drink it at Nancy's apartment from her liquor cabinet. I'm not a big grapefruit fan, but I like Fresca. I always thought it would be an interesting soda to make a drink with. Kendra, here's what to do with that pesky rum. MxMo LII: Forgotten Cocktails...OF DEATH.